It seems strange that there was a long buildup to Paul Martin becoming Canadian Prime Minister and only a short time before he was out of elected office. From my perspective he has before during and after being Prime Minister proved to be one of the very best in the entire world in the necessary long range thinking that is so missing in world governance. Politics as a game played with restricted resources that all too often works out not so good for the citizens. 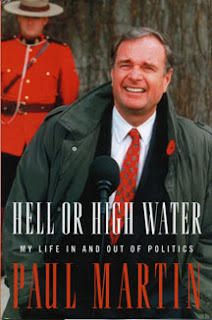 As the son of a prominent Canadian cabinet minister, also named Paul Martin many people think he started with a leg up. To a large degree he would acknowledge that and Paul Jr would proudly admit his father was a model. Others felt he must have inherited a lot of wealth to have been owner of a large shipbuilding company. He was smart enough and connected enough to work at Power Corporation. At one point he was asked to find a buyer for CSL group, a major shipbuilder and instead wondered what he could do to buy it. He didn't have nearly enough money, but did seek out a partner and was able to finance it. It wasn't a sure thing at all. Canadian shipbuilding was very limited, but he realized one of its strengths was that because they had relatively short hauls compared to ocean liners they had developed a lot of inland unloading capacity. They developed the concept for other countries with in land shipping concerns. One factor that impresses me the most is that Paul Martin is perhaps the best example of a long range thinker. One of his themes in his "Come Hell or High Water" is inter generational fairness. That was one of his motivations for reducing the deficit. He could see that today's deficits would be paid by tomorrow's taxpayers and didn't feel that was ethical. Lots of conservatives pontificate about how government's waste money, but Martin did something about it with the long range goal of making government finance more effective for all Canadians. He also didn't think it fair that the G7 made decisions that affected the whole world, but excluded many of the upcoming powers such as China, India and Brazil. Starting as finance minister he worked to set the foundations for the G20. It was not just a question of fairness, but of being more effective for everyone's benefit. Most Canadians reflexively hate the GST, but Paul Martin can see beyond the outcry. The GST actually is a replacement for a hidden tax, the Manufacturer's Tax that hit every Canadian consumer. In the Canadian economy as in most advanced industrial countries was shifting activity from manufacturing to service and manufacturing tax was diminishing. Again a long range viewpoint concerned about fairness and effectiveness. He looks at native Canadians not as unjustly treated over the centuries, but as a lost resource. As a student working summers he spent time above the Arctic Circle becoming more aware of the plight of natives. As Prime Minister he convened many native leaders together at Kelowna and worked out some agreements. Lately he has been involved with educational initiatives and organizing to give natives practical business experience and capital to start businesses. He also took an interest in Africa, again realizing there is hidden potential. There has been a history of Canadian politicians supporting African causes--Brian Mulroney worked against apartheid, Jean Chretien advocated strongly for Africa at the G7 level. Paul Martin carried those concerns forward and has made it one of his focal points after leaving the government. He feels the Palestinians have been treated unfairly. He notes that when Israel withdrew from Gaza unilaterally they allowed Hamas to claim it as a military victory instead of giving Fatah a chance to claim some diplomatic leverage. Canada needs to be balanced in its approach to Israel and Palestine which cannot be said of the current government. The environment was still another concern. He was well aware that Canada could not live up to the Kyoto agreement. He found the Americans under George Bush very obstructionist on climate change. You don't get to be Prime Minister by being naive about politics. The long buildup developed as he proved himself to be the key to the Liberals staying in power, but was kept in place by a resentful boss. Politics can be viewed as a dirty game. He first ran for Parliament in a Montreal riding and overcame some disadvantages to win. He made an early run for the leadership and although he made a strong impression Jean Chretien did win. When the Liberals came to power his reward was to be made Finance Minister which is not considered a stepping stone to the top office, although it must be said Chretien did go that route previously. Paul became one of the best Finance Ministers in history and for many Canadians overshadowed Chretien. That caused a lot of resentment. Once in power of course the other parties are maneuvering to take him down. He developed a reputation as a "ditherer". In fact he was very careful to consult all stake holders and analyze all options. Not a trait that most politicians strive for, but one more suited for long range thinking. He had been kept away from Quebec patronage, yet found himself being implicated. He was far more open about a judicial enquiry than any of his opponents and I believe has since been vindicated. Nonetheless this doesn't stop the opposition from pressing their distortions as dramatically as they can. The Conservatives under Stephen Harper were implicated in misuse of election funds and in fact did catch the Liberals off guard. The Harper government to my way of thinking has proved they don't value fairness in election financing as they repealed the rule that gave smaller parties (and the established ones) a small amount of money for each vote they were able to gain. Outsiders never really know what politicians are up to and I do not have inside information. I read his book and checked my memory and a few other more reliable sources. Most politicians I have observed are big on promises, but mostly concerned what they have to do to stay in power. To be sure they mostly have an idea of what they would like to accomplish. I align myself with most of Paul Martin's vision and appreciate what he has done and is doing to move us closer.